IQ TECHNOLOGY SOLUTIONS has partnered with Pronto Marketing to provide you with an affordable, headache-free and online marketing solution. Get one month free when you signup through IQ Technology Solutions! We don't use templates for our websites. You're unique and we'll design a site that reflects that. And because our subscription model allows for unlimited design revisions, we'll work with you until you're 100% happy. Writing self-promotional copy is awkward and time-consuming. Pronto's content writers craft copy that tells your story and helps you communicate effectively with visitors - all while ensuring that search engines love you. Pronto's managed hosting ensures your site is always ready to greet your customers. Our technical team anticipates updates, fights spambots and squashes bugs - so your peace of mind is as stable as your site. We'll index your site with all major search engines (Google, Bing, Yahoo) and our experts help you navigate the complexities of SEO, analyze your traffic trends, and implement simple improvements. We're a one stop shop to help you get more traffic and leads. Your visitors can chat live with our 24/7 chat team trained to capture leads. Starting at $15 per lead. Get more qualified leads through a proven process that scales with your budget. Starting at $350 per month. Every month, we'll prepare an email newsletter based on the articles in your blog. Once you approve, we'll deliver to your list, while you get all the credit. Once we've redesigned your website, we can create offline PDF versions for you to print and hand to prospects. Starting at $300 per brochure. We host and maintain over 1000 websites around the world. Professional grade and bullet-proof, it's the ultimate website platform for your small business. Every website we build with Phoenix uses responsive design, which means every page will render correctly and convert visitors, regardless of their device. From smartphones to tablets to laptops to PC monitors, it's great to know that your website will always be looking its best. Design, copy, navigation, calls-to-action, forms, links, downloads – it's all got to work, and work together well. Nothing loses a potential customer faster than a broken website - it creates a terrible impression of your business. Thanks to Pronto's vast experience and attention to detail, you're in safe hands. There's more to building a website than meets the eye, and there's more to a website than just eye candy. Your business deserves a website that loads fast, is always available and well protected against threats. Pronto ensures your website is performing at the top of its game – around the clock. platform for your small business. Every website we build with Phoenix uses responsive design, which means every page will render correctly and convert visitors, regardless of their device. From smartphones to tablets to laptops to PC monitors, it’s great to know that your website will always be looking its best. 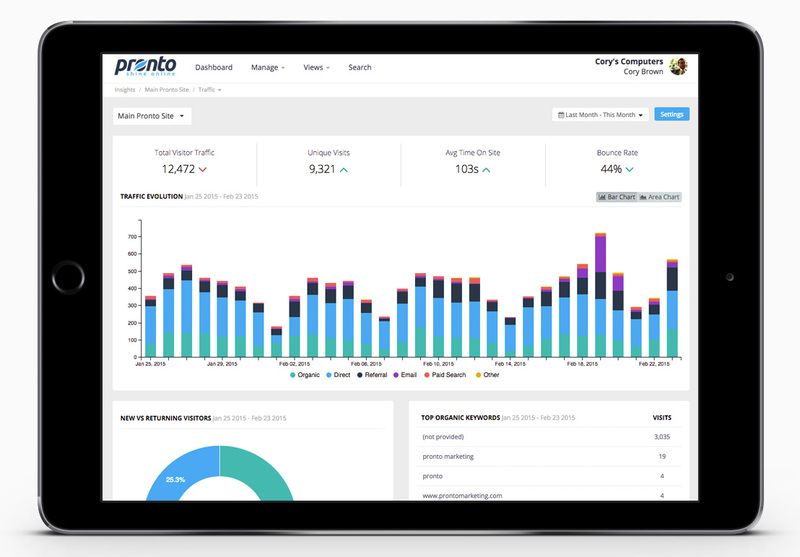 View traffic, leads, keyword ranking and competitor info all in one easy to understand dashboard. Finally, an analytics platform that isn't overly complicated, but with enough information to provide valuable insights. Every month, we'll email you a custom report outlining how your website has done in the past 30 days. Our team of experts are standing by to answer any questions you have. All for one low fixed monthly price. We believe that your Internet Presence has more to do with our people than it is about our technology. Five days a week, 24 hours a day, we work together to work for you. Watch "How To Get Started"
Getting going with Pronto is easy. Follow the sign up link below to get started, or contact an expert to get your questions answered.